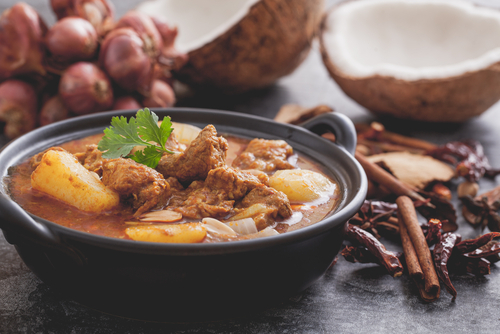 A Thai Dish, Massaman Curry is thought to have been influenced by Persian Merchants during the 17th Century. Interestingly, this dish is associated with a wide variety of meats, such as Duck, Goat, Mutton, Beef, but never pork due to the Islamic dietary laws. Kaffir Limes. The star of this dish are the Kaffir Lime Leaves, which are in peak season. These homely limes with the bumpy rind are prized for their fragrant leaves which have a sweet, lemony scent. The peel is even more aromatic than the leaves with a unique, exotic perfume. Kaffir lime leaves, along with lemongrass and galanga, are indispensable for authentic Thai cooking. Goat. Known to have meat with one of the most distinct and evocative flavors, Goat remains an exotic meat for Americans….but not the rest of the world. Goat accounts for 70% of ALL the red meat consumed worldwide and is certainly not considered a delicacy. It is easy to see why as the farmland needed to support two cows can support at least 10 goats. A goat is similar to lamb, but much leaner, as there is no marbling in goat meat. The fat tends to accumulate in their body cavity rather than in the muscle. Because of this, we will be braising the leg for 8 hours. Som Tam. Som Tam is a savoury and sour salad that was recently elevated next to the Nicoise and Caesar by being named the World’s 50 most Delicious Foods by CNN (#50 was buttered popcorn!). This salad includes Green Papaya, Garlic, Bird’s Eye Chili, French Beans, Cherry Tomatoes, Lime, Tamarind, Fish Sauce, & Palm Butter, and Peanuts….a whole lot of big flavors.